I am incredibly lazy. Well, at least from a cooking perspective. I do not like spending much time in the kitchen. [The only exception to that rule is when I'm preparing desserts, in which case my continual tasting of the dough keeps me going.] So when it comes to cooking vegetables– it better take 5 minutes to prep. For the past year I’ve relied almost exclusively on steamed vegetables. The microwave steamer bag = pure genius. I have recently branched out and realized a slightly more energy intensive way to cook vegetables, but still right around my 5 minute requirement. Roasting vegetables! Roasting makes pretty much ANY vegetable taste fantastic. More importantly, all you have to do is chop the vegetable, toss it in a casserole dish, and sprinkle a tiny bit of butter on it. So far I have only subjected turnips and beets to such treatment, but I intend to try many more! Maybe even those vegetables I’ve always hated… zucchini, I’m looking at you. 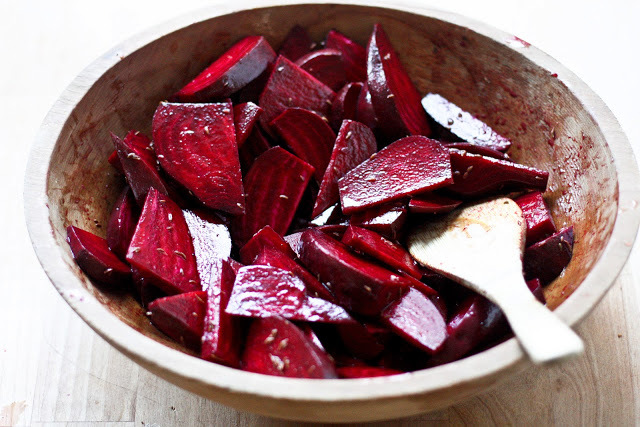 Without further ado, I give you roasted beets! Disclaimer: The recipe picture is from a slightly more complex recipe by Sylvia over at “Feasting at Home.” My camera decided to be uncooperative the evening I made this recipe and simply did not do the recipe justice. 3. Combine all ingredients in casserole dish; add water just to cover bottom of pan. 4. Cover with foil and back for 45-60 minutes, until beets are tender.